Contest will be conducted April 8, 2019 to May 3, 2019 with the winner announced Monday, May 6, 2019. The contest will be conducted between the hours of 6 AM and 7 PM every weekday, Monday through Friday, throughout the contest period. The grand prize winner will be selected at random from all qualifiers, and announced on air, on Monday May 6, 2019. Contestants must have valid PA identification to be eligible to win, and must present that to Eagle 107 upon request. 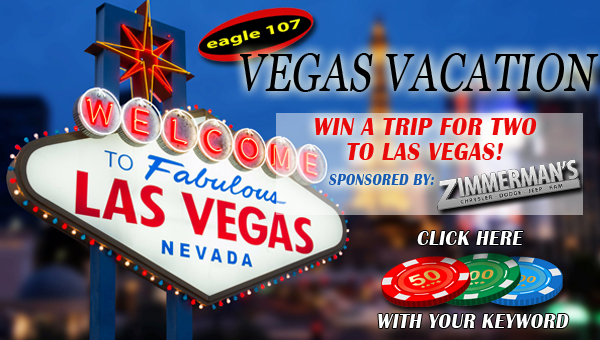 Contest is open to Eagle 107 listeners 21 and older who are legal residents of Snyder, Union, Montour, Northumberland, Columbia, Lycoming, Perry, Dauphin or Juniata counties. Full and part time employees of Sunbury Broadcasting Corporation, any other radio company, and their immediate families are not eligible to participate in this contest. Eagle107 and Sunbury Broadcasting Corporation, their representatives and assigns will not be responsible for any claims, liabilities or damages arising out of or in conjunction with any prizes won in this contest. All prizewinners relieve Sunbury Broadcasting Corporation and any other promotional partner from such claims, liabilities and/or damages. Eagle 107 is not responsible for telephone, network, electronic or computer failures of any kind. All winners shall release to Eagle 107 and Sunbury Broadcasting Corporation the right to use any recording, photography, email, Facebook posts or comments, texts, Twitter messages or other voice or data transmission associated with this contest. This may be done for any and all promotional purposes associated with this contest. Grand Prize Winner MUST have a valid ID at the time of travel. Winner is responsible for taxes and transportation to/from the departure airport. Prize has no cash value and cannot be transferred. All itineraries are subject to change without notice. Flight dates are based upon availability. 2 show tickets to one of the following shows: THE LAUGH FACTORY OR DAVID GOLDRAKE: IMAGINARIUM OR PURPLE REIGN: PRINCE TRIBUTE SHOW and ROUND TRIP AIRFARE FOR 2. Not included: transportation to & from airport; items of a personal nature; photographs, and medical services. Eagle 107’s live internet stream at www.eagle107.com operates a delay from its FM broadcast. Delay times vary, and can be anywhere from 15 seconds to over 5 minutes. Please take that into account when participating in this and all contests. There will be one grand prize awarded. Total number of qualifiers and odds of winning can vary. Eagle 107 has final authority in all disputes. Sunbury Broadcasting Corporation management’s decisions are final. Anyone falsifying information, such as misrepresenting one’s age, identification, or other, will immediately disqualify them from winning any prize in this contest.